Sunnyside Road trail access opens at 7 a.m. daily, year round. 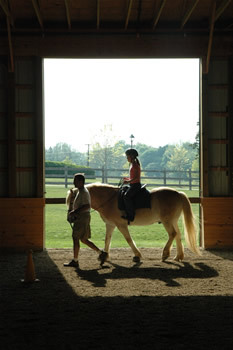 The Sunnyside Equestrian Center is the home of the Park System’s Equestrian Division. This division provides fundamental equestrian experiences for people of all abilities, with an emphasis on offering the benefits of therapeutic horseback riding to individuals with physical and cognitive disabilities, helping them to develop to their full potential. The equestrian program operates with the financial support of Special People United to Ride, SPUR, a non-profit organization dedicated to sustaining the Park System’s therapeutic riding efforts. The therapeutic horseback riding program also benefits from the assistance of dedicated volunteers. Each year, over 100 volunteers assist with lessons and care of the horses. These volunteers, who are at least 14 years of age, have completed a volunteer training workshop. For more information about volunteering, please call 732-224-1367 or e-mail info@monmouthcountyparks.com. To learn more about lessons, click here. This program is dedicated to helping people with physical and cognitive disabilities achieve their personal goals through horseback riding. The experience of riding a horse provides physical, emotional and psychological stimuli. Meeting for 30 minutes each week, students work to improve balance, muscle tone, posture and more. More than a dozen carefully chosen and specially trained horses participate in the program. Many of them have been donated. For information about donating a horse to the program, please call 732-224-1367. Special People United to Ride partners with the Park System to provide people with disabilities the opportunity to participate in a therapeutic riding program. Established in 1981, SPUR has raised funds for the construction of the Equestrian Center, student scholarships, acquisition of therapy horses, purchase of special riding equipment and training of instructors. For more information, visit www.spuronline.org. In 1933, Harry and Katherine Neuberger purchased the 121-acre property and began transforming it from a working farm to a country estate. The Neubergers made a number of improvements to the property, including transforming the style of the main house to colonial revival through alternations and additions. The Monmouth County Board of Chosen Freeholders preserved the Neuberger property as county open space in 1990. The Equestrian Center is the first significant improvement to the recreation area. A portion of this 135-acre site is preserved as open space in the form of a vegetation management project. This project is being coordinated with the United States Department of Agriculture/National Resource Conservation Service and Monmouth County Agricultural Extension Office. The site features a 0.5 mile paved loop trail and 0.4 mile unpaved trail extension. Parking lot for trail is on Sunnyside Road. Garden State Parkway to Exit 109. Southbound, turn right onto Rt. 520 west (Newman Springs Road); Northbound, turn left onto Rt. 520 west. Continue to Middletown-Lincroft Road. Turn right and continue 2 miles to entrance on right.